The Classics name dates back to 2001. 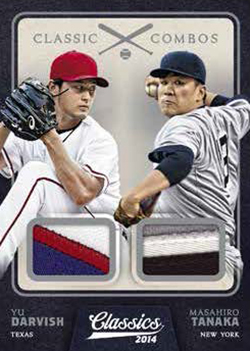 However, some of the content in 2014 Panini Classics Baseball goes back much, much further. 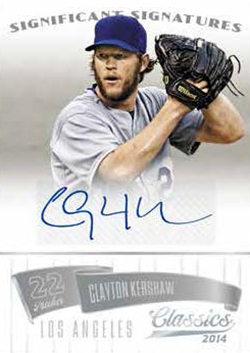 Every hobby box comes with a pair of autographs, two memorabilia cards and lots of inserts. 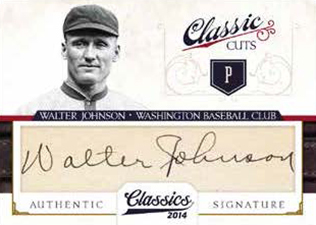 The majority of autograph content in 2014 Panini Classics Baseball can be found in Significant Signatures. The set has 100 signers that range from current players to prospects to retired stars. Among those slated for the set are Clayton Kershaw, Stan Musial and Kris Bryant. Jersey Prime versions are also numbered to 299 or less and Bats versions have no more than 99 copies each. All three tiers of Significant Signatures cards (basic autograph and memorabilia) have Gold (#/25 or less) and Platinum (1/1) versions as well. Home Runs Heroes centers on the legends on the long ball. A total of 25 players are featured with a full range of jersey, bat, multi-piece and autographed memorabilia cards. Of all the combinations, none are numbered higher than 99. Premium parallels are much rarer. October Heroes, Stars of Summer and Legendary Lumberjacks all follow a similar pattern. 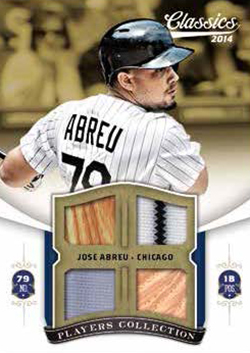 Twenty-five more players are given the spotlight with Jerseys, Jerseys Signatures, Bats, Bats Signatures, Combos and Combos Signatures versions as well as Prime parallels. Classic Combos (25 cards, #/99 or less), Classic Triples (20 cards, #/99 or less) and Classic Quads (15 cards, #/99 or less) highlight teammates that can date back more than 100 years with the likes of Ty Cobb and Sam Crawford. There is one exception that pairs up Japanese pitchers Yu Darvish and Masahiro Tanaka. Membership Materials uses memorabilia to explore some of baseball's prestigious groups. Cards are dedicated to Hall of Famers, MVPs, Rookie of the Year recipients, 300 Win and 500 Home Run Club members. All have basic memorabilia as well as autographed memorabilia versions. 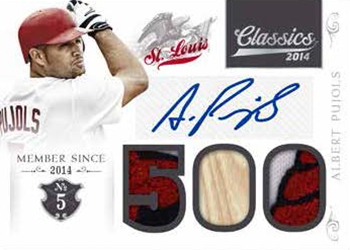 Other memorabilia-focused inserts in 2014 Panini Classics Baseball include Legendary Players Materials (25 cards, #/99 or less), Timeless Treasures (40 cards, #/99 or less) Champion Materials (20 cards, #/99 or less) and quad-piece Players Collection (20 cards, #/99 or less). Like other parts of the set, patches and premium swatches can be found in various Prime parallels. 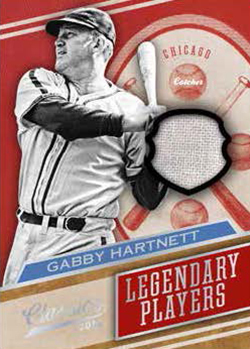 It is worth noting that 2014 Panini Classics Baseball includes the first memorabilia cards of Roger Bresnehan, Gabby Hartnett and Bob Meusel. 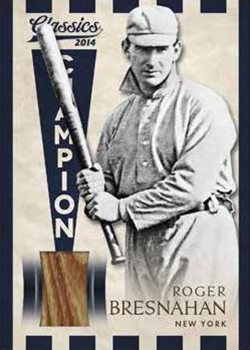 According to the card maker, the set features many early Hall of Fame members, nine .400 Club members and 11 Triple Crown winners. For those looking to build the 2014 Panini Classics Baseball base set, it shouldn't be too difficult. The full set has 150 base cards plus another 50 rookies. Given the box configuration and the fact that rookies average two per pack, it's a reasonable task that shouldn't take much more than a master box to complete. Base cards have three Timeless Tributes parallels that combine to fall two per hobby box: Silver (#/149), Gold (#/25) and Platinum (1/1). Collectors will find four different basic inserts in the product. 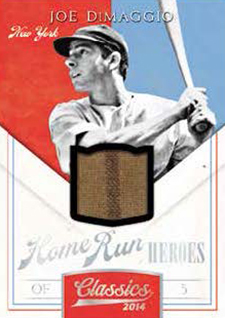 Home Run Heroes, Legendary Lumberjacks, October Heroes and Stars of Summer all have 25 cards and are inserted 1:4 packs. 2014 Panini Classics Baseball is done in a mini box format with each holding 12 packs. This makes it more affordable for those looking for hits but might not have the budget for a full master box. An autograph and memorabilia is guaranteed in each mini box. Please note the following images are mock-ups and not actual cards. View the exact prints runs with the Excel checklist here. This looks nice but again here lies the problem..There was no need to put the prospects and rookies into it. There are plenty of sets out there for them. Why can’t we just have the old guys and the veterans by themselves? They have to try and grab every single type of collector. Greed! This checklist is huge. Cut out the rooks and prospects to narrow it down a little. Though there aren’t many prospects, it’s still the point of why do they need to be in everything? And at $125 a box you end up pulling a couple of these young guys that aren’t worth much and you’ve already lost your money. Panini just did there break of this on there blog and they pulled Johnathan Gray and Chris Owings auto relics out of each mini box. That is not what I want to pull if I’m buying this for $1250 These Companies just cannot leave out players in there sets that ruin not only the value but the whole experience. I mean they put a Donruss Rookies box out for the Holidays with nothing but Rooks. Why do they have to be in this to Panini? It’s overkill! There’s to much already out there of these guys! i feel compelled to agree with Dukester above. For those of us chasing the pre-1980 players (pre-steroid) and the old HOF’ers, I would gladly trade all of my rookie cards for one fair player from 1920 to 1960. Leave the rookies who will vanish within two years to their own boxes and give us the time-tested players in boxes over $100. What a waste of a product opportunity. And I didn’t do too badly on the two boxes I bought. I pulled a dual bat relic of Ted Kluszewski /10, a Phil Rizutto Timeless Treasures SP parallel /25, Buster Posey Relic /99. On the other box, did a bit better, got a Chris Davis Stars of Summer Dual Jersey/Bat /99 and David Ortiz Homerun Heroes jersey auto /10. I think the boxes should be about $100. Give it a few months. The fact that Jeter signs in this, may explain the high price, though the 2 boxes I bought are probably not the norm. Forgot to mention. The first box I pulled the dual bat of Ted Kluszewski and Frank Robinson, I also got a Legendary Lumberjacks Jersey Auto of Frank Robinson /10. SO not bad. Though, like I said, probably got lucky on the two boxes. These are just the ones I remember off the top of my head. Almost every box I opened had 1 or 2 quality hits out of the 4. Only one box was missing a hit and Panini replaced it plus a bonus within 3 weeks. 2014 PANINI CLASSICS BASEBALL HOBBY BOX - KRIS BRYANT AUTO ? !